Don't know what to buy that special Chicago sports fan? Send an online WrigleyvilleSports.com gift certificate! Just fill in the information below and we will send the recipient an email containing their Gift Certificate number. 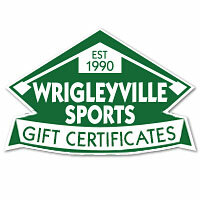 This gift certificate can be used online (during checkout) or at our retail store Across From Wrigley Field!